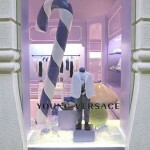 The house of Versace opens its first children’s clothing store in Milan, Italy. We had a lot of fun making holiday gift baskets. We found these apple baskets at Michaels, and they pretty much set the theme. We used mason jars, purchased at any grocery store in Calgary, and a heritage-style decorative corner paper punch for our homemade tags purchased at an arts and crafts store. 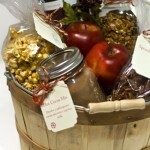 In these baskets we included Caramel Corn, Spiced Pecans, Mango Pumpkin Seed Granola, and Hot Cocoa Mix. The wonderful thing about these holiday gift baskets is you can have them pre-made and give them out throughout December. Or, by varying the items and decorations, these baskets can easily become gifts suited for year-round giving. These spiced pecans are without fail a party hit. Every time we bring these tasty snacks to a friends’ party, they ask for the recipe. The balanced, nutty and spicy, yet sweet, flavour complements most cocktails or wines. 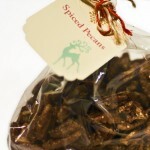 Nicely packaged, these pecans make a great gift on their own or added to a Christmas holiday basket. 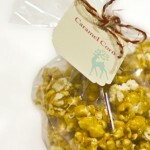 Popcorn is one of my favorite things on the planet. Whenever I walk past a movie theater and smell popcorn it is near impossible to fight the urge. Thankfully, Eric is always there to remind me of the calories, so to satisfy my craving I resort to making my spicy Caesar popcorn — what I also like to call ‘Jenny Craig popcorn’ since I add zero butter. Luckily, tis the season to be jolly and if I am ever going to add more butter then Ina Garten or more sugar then Paula Deen it is during the Christmas holidays. 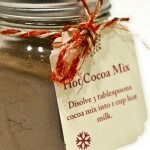 This delicious hot cocoa mix is probably the simplest way to create a unique, personal, and inexpensive gift.